When it comes to life’s greatest things, it’s hard to beat beer and babies. 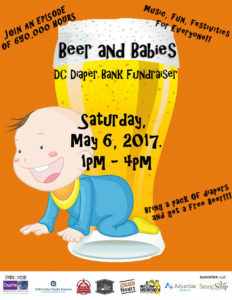 On May 6, for the debut episode of 650,000 Hours—a new web series on the real-life heroes who make America great—Ken Budd will be hosting a “Beer and Babies” diaper donation party at the DC Brau brewery to benefit the DC Diaper Bank, one of D.C.’s most impressive charities. Since 2010, the diaper bank has distributed over 4.5 million diapers to families in need. Diapers are expensive, and in Washington, D.C., 44 percent of children under age three live in low-income families. The goal of the event: To break the diaper bank’s one-day donation record and raise money for families in need. The party will last from 1:00 – 4:00 p.m. and will feature fun and games for kids, food trucks, live music, brewery tours, raffles, and—best of all—BEER! Invitations and ticket prices will be coming soon. 650,000 Hours is based on a simple premise: The average human life lasts 650,000 hours. How will you spend yours? To answer that, we’ll be spotlighting the daring and daunting work of passionate Americans who are transforming communities and changing lives—and who’ll make you feel good about your country. We need your support! Here’s how you can make a tax-deductible donation to the series. • Your logo will appear in the debut episode of 650,000 Hours, which will reach thousands of viewers via Huffington Post, YouTube, and an online network that includes multiple social media accounts and popular travel sites. • Your logo will also appear on signage at the event and all promotional materials, including event-related social media, the event web site, and press releases. We’re planning a major campaign to attract local media coverage. • You can share coupons or other materials at the event. Co-producers of 650,000 Hours are Creative Strategies Media—whose founder, Dara Padwo-Audick, has produced and directed shows for networks such as National Geographic, Discovery, ESPN, Animal Planet, CBS, Fox, Lifetime, and PBS—and Golden Globe and Emmy-award winning documentary film company Spark Media, led by Andrea Kalin, which is based in D.C.
Sponsors of the event include Advantia Health, DC Brau, Mellow Mushroom (in Adams Morgan), and RBH Global Wealth Partners.